Who thought that even washing could be fun with our sea creature soap shapes. This novel idea makes it possible for a person to hold a sea horse in their hand while at the same time cleaning the hands of bacteria and dirt. This can help you relax and just maybe recollect fond memories of when you where in the tropics or on a beach enjoying yourself. Our Sea Horse Shaped Hand Soap (40-492) comes in a set of two. They are only 2 inches tall so they are as close to the real thing that soap can represent. They have a soft baby powder scent to them so you will not only be clean but smelling fresh when you are done. The colors they come in are Fuchsia and Salmon Pink. These colors are unique enough to get noticed without being overpowering in the soap dish. If bright colors for your soap dish are in your agenda then the bright green palm tree shaped hand soap (40-496) might be just what you need. This bar has all the detailed lines of a palm tree so it will be realistic. It is slightly larger than the Sea Horses being 3 inches tall and 2 inches wide. The Palm Tree bar of soap is also scented with Baby Powder so you will be clean without the odor of soap on you. The brightest color bar of soap is the Pink Flamingo Shaped Hand Soap (40-489). As you can imagine, this is in the color of very bright pink. The detail in this soap along with the color allows this bar to last the longest because most people are afraid to use it. It stands at 3 inches tall and 2 inches wide and will be an attractive accent to any bathroom and soap dish that wishes to have a tropical theme to it. The hibiscus flower is native to the tropical region of the world. This beautiful flower is also known as the rose mallow. Our Hibiscus Flower Shaped Hand Soap (40-460) has the 5 distinctive and soft pedals of the real flower. These come in a set of two soaps that are 2 inches in circumference. The colors are an inviting pink and red. Both flowers are also scented with baby powder. 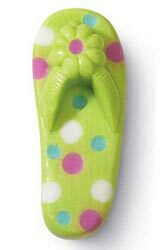 To help with a flare of beach and excitement to your soap dish there is the Flip Flop Shaped Hand Soap (40-508). These are not your usual shaped soaps, they are very decorative and will stand out in your soap dish. They come in a set of two being 3 inches tall. They come colored in a lime green with white, pink and blue polka dots on them to help give them more character. They are also baby powdered scented to help give your bathroom that clean and refreshing smell. Decorative hand soaps with a tropical or beach theme can be the final touch that you add to your bathroom to change the mood and give your guests a relaxing time when they are visiting. It is your attention to detail, like placing a small but meaningful decorative soap out, that will set you and your abode apart from others.